Central Idea: God wants to give us every good thing, securely, forever. Doctrine: The Senses of Sacred Scripture. Practical Application: Daily reading of the Bible. Lectionary: 66. To view today’s readings, click here. The Chosen People have suffered a great calamity. Jerusalem, their capital, has been destroyed with its temple razed. The people have been killed or carried off into exile. But Isaiah foretells that God himself will rebuild Jerusalem in the sight of the whole world, showing his delight in his Chosen. This marriage-like relationship of love and delight, which God has toward the Jewish people, is recreated in Christ for all people of all time who will become incorporated into his Church. Jerusalem stands for the Church and its inhabitants represent the members of the Church, the Bride of Christ. Not only does God take delight in his people collectively, he is also “in love” with each individual member. Though we live in a fallen world today, suffer, and will die, if we are faithful, we will see God’s love for us, his joy in us, like a groom toward his bride. Something to meditate on and contemplate: If God rejoices in you, how much will you rejoice in God? This psalm sets out the mission of the Church and of each member: to proclaim the marvelous deeds of God to all the nations. We can sing this song now, because we see the beginning of redemption. The Redemption is fully accomplished in Christ and is slowly being applied to person after person who wants it, as the course of history unfolds. We need “holy attire”, that is, to be forgiven our sins and to live in a state of grace. This is why Christ has given his Church the Sacraments, especially Baptism and Reconciliation. St. Paul teaches that God gives the Holy Spirit to each one of us. The Holy Spirit gives us all particular gifts—special to us—for the benefit of the others. There is something unique in each one of us that is up to us to discover. It is an adventure to discover what this gift is and then to exercise it. When Jesus received John’s baptism, the Holy Spirit descended upon him and the Father declared him to be his beloved son in whom he was well pleased. Then Christ went into the desert where he fasted for forty days and overcame the temptations of the devil. Now, at the beginning of his public ministry, Jesus attends a wedding feast with his disciples and his mother. Christ, as the “seed” of Mary, “the woman,” had the mission of defeating Satan, the serpent. The next time Christ will refer to his mother as “woman” will be when he is on the Cross, when his death accomplishes the defeat of Satan. At that moment, his hour will have fully come. 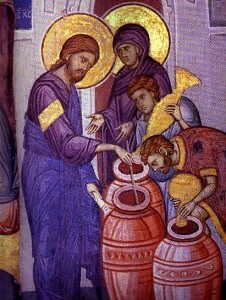 Yet in Cana, Christ acted in obedience to this woman and turned the water into very good wine (Jn 2:10). Why would Christ begin his public life with a miracle like this? One reason is that since only God can instantaneously turn water into wine, Christ was revealing that he was God. Another reason can be seen if we interpret this miracle in the anagogical sense, that is, to view it “in terms of [its] eternal significance, leading us toward our true homeland” in heaven (CCC 117). Wine is an invention in which human beings transform grapes into something new that “gladdens the heart” (Ps 104:15). In this miracle, Christ provided the bride and groom, the host, and all the guests with a superabundance of gladness. Though Christ had just suffered hunger and thirst in the wilderness, he began his public ministry not just by announcing joy but also by giving it in copious gallons of very good wine. This is an anticipation of the wedding feast of heaven where God will give us every good thing forever. Indeed, the Catechism tells us that heaven is “wholly communion and feast” (1136). The Church teaches us that the Bible should always first be interpreted in its literal sense, that is, in the sense that the Sacred Writer directly intended it to have. For example, in today’s Gospel, St. John narrates the historical event we call the Wedding Feast of Cana. When we read the Bible, we have to think about what kind of passage we are reading. Is it history (Acts), or poetry (the Psalms), or prophecy (Isaiah), or law (Deuteronomy), or exhortation (Epistles)? Besides the literal sense, many passages of Scriptures can also be interpreted in various “spiritual” senses. For example, besides being the first woman, the mother of all the living, Eve is also a type or symbol or foreshadowing of another woman who would come, the Blessed Virgin Mary, the mother of all who live in Christ. Another spiritual sense is the moral sense, what the passage might tell us about how to live our lives. We also have a great example of that here. Mary tells the servants, “Do whatever he [Christ] tells you.” Could we have better spiritual direction than that? Finally, a third spiritual sense is what the passage says about our final destiny or eternal life, the anagogical sense. The wedding feast of Cana in which Our Lord provided a superabundance of very good wine tells us something about the happiness which awaits us in heaven. The picture of Jerusalem which Isaiah paints for the exiled Chosen People is also an image of the heaven we struggle for. A very basic but fruitful piece of advice is that every Catholic who has attained sufficient maturity should spend five minutes every day reading the Bible. The Gospels are the most important Biblical books to read. If you spend just five minutes a day at it, you can easily read the entire New Testament twice in one year. St. Jerome said, “Ignorance of the Bible is ignorance of Christ.” Reading the Bible every day is a great way to grow closer to Our Lord. This is why it is good to read the Gospels again and again. A startling thing the early Church Fathers discovered was the way the Old Testament foreshadowed the New Testament and how the New Testament explains so much of the Old. In fact, they saw the Bible’s many diverse books as really one book about Christ. The first is to try to read the Old Testament in light of the Gospel, in fact as if it were speaking about Christ’s Redemption. For example, read the Psalms as if Christ himself were praying them. The second is to use the analogy of faith. “Analogy of faith” means “the coherence of the truths of faith among themselves and within the whole plan of Revelation” (CCC 114). Practically speaking, this means you try to understand the Bible in light of everything you know about the Catholic faith. When something doesn’t make sense to you, keep a light touch. For example, if it seems rude to you that Jesus calls his mother “Woman,” don’t rashly conclude either that Jesus was a rude person or that it is okay to be rude to your mom. Finally, we should read the Scriptures prayerfully. St. Jerome says that when we pray we speak to God; but when we read [the Scriptures], God speaks to us. When we read the Scriptures we are listening to God’s answers to our prayers. So, our reading should be prayerful: We should dialogue with Our Lord as we read. The overall message we should always be getting from God through the Scriptures is joy, because God takes delight in us and wants to give us every good thing, securely, forever in the “New Jerusalem” or “wedding feast” of heaven.